The Complexity of staging The Wall live meant that Pink Floyd could not take it on the road, as they had done with live performances of their previous albums. Instead, The Wall had to be set up days in advance at a select arena, performed for a series of shows, and then dismantled over the course of a couple of days. As a result, The Wall was performed in only two venues in the United States, and two more in Europe, for a total of just 31 shows. 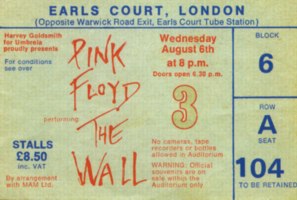 * This show is the third of six at Earls Court, 6th August, 1980. *Fitch, Vernon, and Richard Mahon. Comfortably Numb – a History of “the Wall”: Pink Floyd 1978-1981. 1st ed. St. Petersburg, FL: PFA, Inc., 2006. 187. This entry was posted in 1980-81 Wall Tour by Doc. Bookmark the permalink.